Go is . 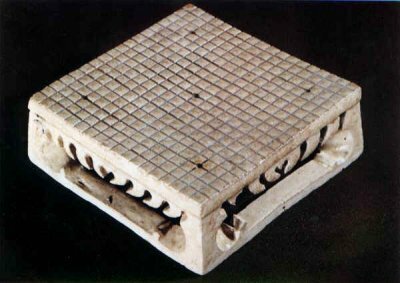 . . ancient board game which takes simple elements: line and circle, black and white, stone and wood, combines them with simple rules and generates subtleties which have enthralled players for millennia. 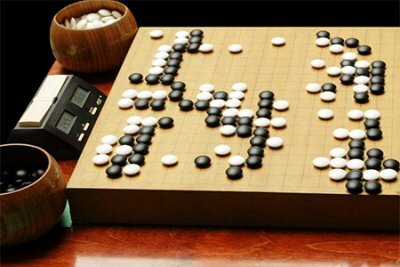 Go's appeal does not rest solely on its Asian, metaphysical elegance, but on practical and stimulating features in the design of the game. Go's few rules can be demonstrated quickly and grasped easily. The game is enjoyable played over a wide spectrum of skills. Each level of play has it charms, rewards and discoveries. A unique and reliable system of handicapping bring many more players "into range" for an equal contest. Draws are rare, and a typical game retains a fluidity and dynamism far longer than comparable games. An early mistake can be made up, used to advantage, or reversed as the game progresses. There is no simple procedure to turn a clear lead into a victory -- only continued good play. The game rewards patience and balance over aggression and greed; the balance of influence and territory may shift many times in the course of a game, and a strong player must be prepared to be flexible but resolute. Go thinking seems more lateral than linear, less dependent on logical deduction, and more reliant on a "feel" for the stones, a "sense" of shape, a gestalt perception of the game. Beyond being merely a game, Go can take on other meanings to its devotees: an analogy for life, an intense meditation, a mirror of one's personality, and exercise in abstract reasoning, a mental "workout" or, when played well, a beautiful art in which black and white dance in delicate balance across the board. But most important for all who play, Go, as a game, is challenging and fun. To learn more about why millions of people have loved this game for thousand of years, visit our Top Ten Reasons to Play Go; or, if you prefer, start playing go right now! Go combines beauty and intellectual challenge. In Asia, it is often played on a traditional, carved wooden board, with black and white stones made from slate and clamshell, but good affordable equipment is also available. In either case, the patterns formed by the black and white stones are visually striking and can exercise an almost hypnotic attraction as one "sees" more and more in the constantly evolving positions. The game appeals to many kinds of minds -- to musicians and artists, to mathematicians and computer programmers, to entrepreneurs and options traders. Children learn the game readily and can reach high levels of mastery. Because go lends itself to a uniquely reliable system of handicaps, players of widely disparate strengths can enjoy relatively even contests. The game can be a casual pastime for the idle hour -- or a way of life. Michael Redmond, the only Western player to have won status as a top-grade professional player in Asia, when asked why he had devoted his life to go, replied, "Because I love the game."